When you want a truly enigmatic gift for your loved ones, this is the hamper you should target. This is a vibrant and delicious hamper that would uplift anyone's bad mood. 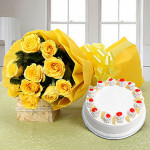 The bunch of cheerful yellow roses and a delectable pineapple cake is all you need to wish someone on happy occasions. A truly vibrant and delicious hamper is all what it takes to lift up the mood. Escalate the happiness level of your loved ones with this bunch of 10 bright yellow roses with lots of fillers in yellow packing finished with a ribbon and Half kg pineapple cake.